I made these waffles with a homemade gluten-free flour mix. The recipe is here. It is a hearty flour mix with a pretty strong buckwheat taste. I liked that for these waffles, it went well with the nuts and also with the maple syrup. But of course you can just try these with any flour mix you have on hand. The locust bean gum is optional, but it improves binding. For the flours I went with metric measurements only. If you want to swap out anything it is easier to do this measuring your ingredients by weight. I weigh all my ingredients and look most of the cup measurements up here. If you are not gluten-free and do not have gluten-free flour on hand, I suggest you use all-purpose flour instead. It should work. In that case, you can leave out the locust bean gum. And maybe you have to adjust the liquid. About the oil: I made regular waffles with less oil, but for this gluten-free recipe the oil really helps making the waffles not stick to the iron. If you want less, you can probably half the amount. Make sure to grease your iron well. Of course you can freeze these and reheat them in the toaster. Edited on October 14, 2013: I suggest not to leave out the locust bean gum. It acts as a thickener and without it the batter will be runny and might stick to the iron. If you have to leave it out, you could try to add some more flour to thicken the batter. I do not recommend to substitute xanthan or guar gum. To make the waffles: Preheat your waffle iron. Brush with oil, if you don’t have a non-stick iron. Combine the flours, sugar, hazelnuts, baking powder, locust bean gum, and salt. (Make sure to sift the flours, especially the chickpea flour.) Mix well and add remaining ingredients. Whisk to combine. Pour the batter into your iron and cook each waffle according to the manufacturer’s instructions. To make the syrup: Combine maple syrup and nuts and pour over the waffles. Serve with fresh fruit. *It’s a German brand hardly available internationally. If you still want to know, you can email me. Mmm! I am absolutely an I-want-to-eat-waffles-all-the-time person, who has sadly never owned a good waffle maker. Someday! 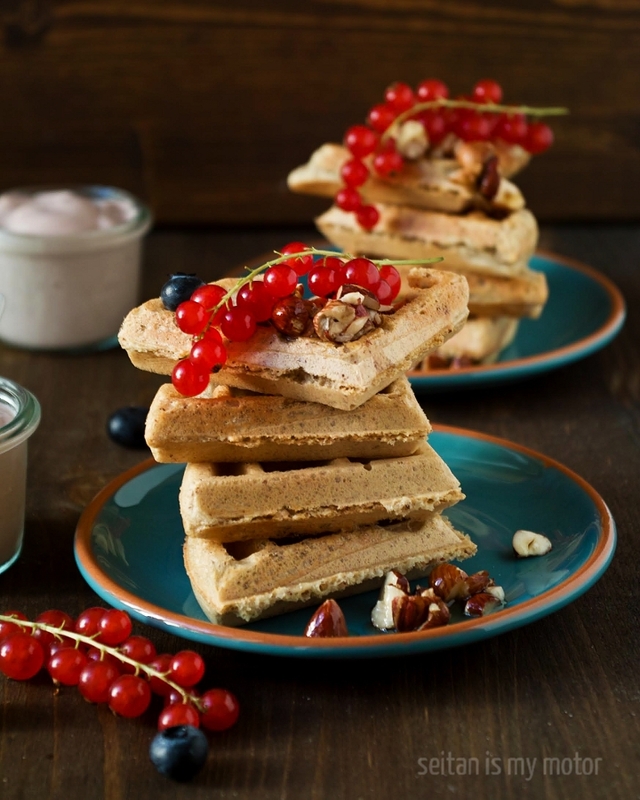 I’m a big waffle fan and love the sound of yours with ground hazelnuts in the batter and the maple nut topping. I used buckwheat flour in my last batch of waffles (blueberry-orange http://coconutandberries.com/2013/07/15/blueberry-orange-buckwheat-waffles/) and really liked the flavour. I’d also be interested to know the waffle iron brand, I live in Switzerland and figure I might be able to find it here, or have it shipped from amazon.de… have been thinking about getting one for ages, maybe now is the time! I’ve been thinking a lot about waffles lately — and waffle irons. I really want one just like yours so I can make perfect gluten-free waffles. I like the idea of a strong buckwheat flavor and will probably add some to my next batch of pancakes — or waffles if I can ever figure out which iron to buy. I was wondering if it would be possible to share the name of your new iron waffle.